Our first digital nomad guide focused on money, taxes and retirement planning. This one looks at some more of the bureaucracy and necessities you need to navigate when deciding to go nomadic, including the best visas for digital nomads, as well as tips on voting when abroad, the best digital nomad ravel insurance, and how best to communicate when abroad. Please remember that these guides are meant as a means of sharing our experiences rather than as instructions on what you should do. We are by no means financial or legal experts! Also note that as we’re from the UK, our experience is most relevant to UK nationals. That said, some of the general advice will apply worldwide. This is a tricky question without a clear answer: do you need a work visa if you’re a digital nomad working in a different country? If you were working offline then the answer would almost certainly be yes, but when it comes to the online world, regulations are less clear – it doesn’t seem that immigration offices have yet worked out how to handle digital nomads who make their living online. For this reason, we (and all the digital nomads we know) choose to enter countries on tourist visas. We don’t mention that we’ll be working online as this would likely cause needless complications. Our logic is that so long as you’re paying tax somewhere, it should be okay. However, if you do start to live somewhere for more than half the year then you may need to start looking into where that tax should go, which may also involve moving to a working/resident visa. You would also need to reconsider your visa status if your clients are/started to be in the country you’re travelling to (for example, you’re a business consultant and you started to consult a lot with local people, or you’re a writer who starts writing for local publications). When you get into this sort of territory, it is more complicated and I would suggest getting some advice from an expert. I would also suggest checking the tax/visa rules for each country before you visit as rules vary from place to place and while these guidelines have worked for our travels so far, there may be some countries that operate outside of that. If you choose a tourist visa, bear in mind that they all vary in length. Some visas can be renewed by simply hopping into a neighbouring country and then re-entering on a new visa; other places allow you to renew within the country; while others are stricter and may make it more difficult to return. I know from other people’s stories that UK immigration is notoriously difficult for long-term repeat visitors. The most important thing is to check in advance what the visa requirements and rules are for each country you’re travelling to. For example, some require certificates of immunization and others have to be applied for in advance. Better to plan ahead rather than get caught out when you arrive. If you’re an EU citizen then you’re free to travel and work in any EU country without need for a visa. This Wikipedia page offers a good overview of EU rules for non-EU citizens. If you want to continue to vote when you’re abroad, you need to register with the electoral register. This is a good idea anyway as it’s often what companies (insurance, credit cards etc) use to verify your details easily. To register, you will need a fixed address. There are some exceptions for people with no fixed address, for example if you’re homeless or in long-term hospital care, but I’m not sure that being a digital nomad would class you as “homeless”. It’s probably easier to use a relative’s address. Digital Nomads who are away for more than a year will come up against a problem with travel insurance: most policies do not let you renew/open a policy unless you’re in your home country. This is obviously a little tricky for people who don’t want to coincide the expiry date of their travel insurance with a visit back home. Luckily, there are a few companies who do let you start a policy abroad. This tends to be a little more expensive. We are currently using Flexi Cover Insurance, which cost £106 for both of us (£53 each) for five months cover in Europe. We were able to start this in the UK so avoided the added premium of starting abroad. We booked our insurance through Quidco, which is a site that offers cashback when you buy things through them. We got an 18 per cent discount by using them to book our travel insurance with Flexi Cover. It’s definitely worth trying. You can also sometimes save money by going through comparison sites like Compare the Market. Before Flexi Cover, we used Worldwide Insure, which cost £768 (£384 each) per year for the two of us worldwide, including extra cover for some sporting activities. We were able to start that policy in Mexico when our previous travel insurance ran out. A lot of digital nomads also recommend World Nomads, which is slightly more expensive. Be sure to check the policy documents and wording before committing to buy. There’s a lot of variation when it comes to policy excesses and the amount of coverage companies provide. We’ve written more on travel insurance here. One thing to note for digital nomads is that most policies do not cover (or have very low limits for) a lot of technical equipment, such as laptops and cameras. One option is to add those items to the home insurance policy at the address you’re registered at in your home country. We’ve registered at Steve’s parents house so have added our laptops and cameras to their home contents insurance policy. If that’s not an option for you, you can opt for a specialized insurance such as Photoguard and Protect Your Bubble. 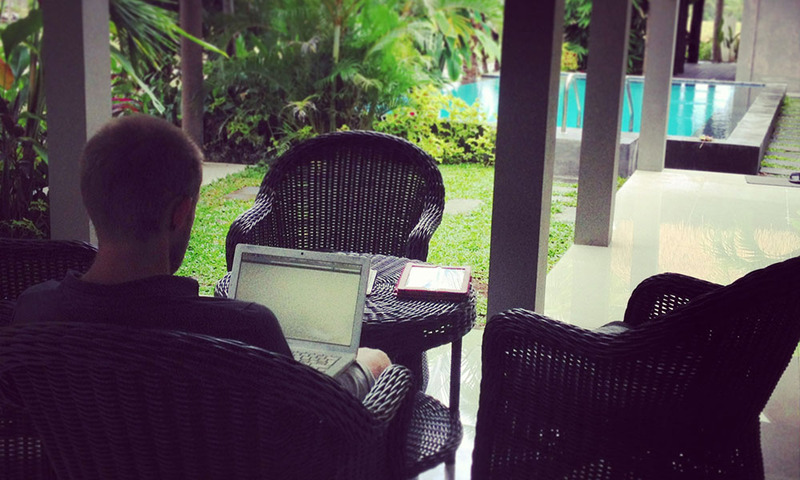 Being digital nomads means that internet connection is often a number one priority when it comes to choosing where to stay. We sometimes go for a week or so without internet but that is holiday / digital detox time. The rest of the time it is essential for our work. Luckily, the modern world has internet in most places. We even found it on a tiny island in Lake Titicaca! That said, it wasn’t very fast. We always make sure that places we intend to stay in for extended periods of time are known for having a reliable internet connection. So far, Ubud, Buenos Aires, Salta and Berlin have been good for us. Other people may have had different experiences as it also depends on the actual connection in your home. For this reason, we always try to check the connection with speedtest.net before renting an apartment. For example, in Chiang Mai the internet is known for being good but it’s also very patchy. Some people choose to use portable wi-fi devices, like hotspots or dongles. We’ve had frustrating experiences with temperamental dongles, and have never tried hotspots. They tend to be quite expensive so are better as short-term solutions. For those who are interested, there’s an article on Lifehacker, debating dongles vs hotspots. In our travel essential series, we have a section on mobile phones, but our advice may not be perfect for all digital nomads as we rarely choose to have data plans. If it’s important to you to have the internet on your phone (rather than rely on wi-fi) then there are a few recommended options. You can buy a pay-as-you go SIM card locally and install it into your existing unlocked phone / buy a new phone. Shop around and you may find that data connection is pretty reasonable. For example, here in Germany, you can get 1GB of data for €9.90 a month. Another option is to go with something like Three’s Feel At Home plan. This allows you to use your UK phone abroad with the same tariff you have at home. It means you can call and text the UK, receive calls and go online without any extra charge. The scheme only covers 11 countries at the moment: USA, Italy, Ireland, Austria, Australia, Sweden, Denmark, Sri Lanka, Hong Kong, Indonesia and Macau. It also doesn’t include calls / texts to non-UK numbers. This hasn’t been a good option for us yet, but we’ll definitely consider it next time we’re going to one of the included countries. It would be very useful for keeping up with friends and family, and also for business in the UK. pocket wifi has looked after me in Phillipines to Australia. you dont need to worry so much about the residence you are in..
something i was able to do in Manila but not else where so easily for example i moved to cebu public firbe internet had DNS or QOS restritcions – so i had to find business leased line internet in a cor working space to function..